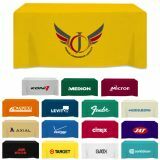 Custom table covers and throws will allow you to extend a warm welcome to your customers during tradeshows and business events. 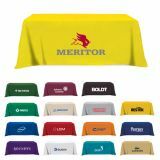 Full color tradeshow table cloths and covers will make people stop and take a look at your branding efforts. 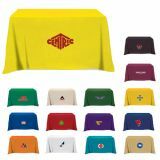 You can build up a positive atmosphere during tradeshows with any of our customized table throws and covers. 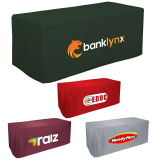 Fast turnaround is a standard for all our promotional table covers and throws. 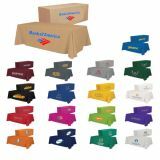 Save on online design proof and artwork assistance as their prices are included! 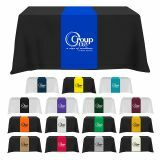 Customized table throws, table covers and table skirts will help you to attract the right kind of audience to your tradeshow booths. 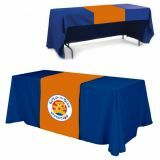 Table throws are used to cover display tables and they are used for great variety of occasions such as school functions, hotels, job fairs, tradeshows and other events. 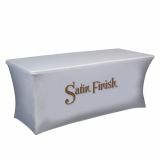 These table throws are not only affordable but also reusable. You can store them and reuse them in the future. 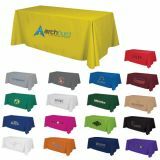 Custom table covers printed with your company logo and graphics are ideal to use at storefronts, farmers markets, tradeshows and business conventions. 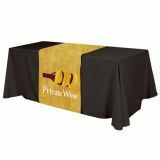 Logo printed table covers, table skirts and table runners offer excellent promotional opportunities to marketers. 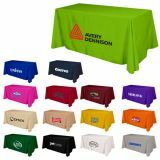 Marketers can use the large imprint area over these table clothes to pack maximum information about their brand. 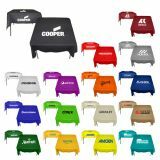 Many table coversdrape the whole table and they look extremely attractive.We offer various printing options in 1 color, multiple colors or full colors. 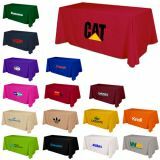 Most of our table covers and table throws are made of high quality premium polyester twill fabric that is machine washable and flame retardant. 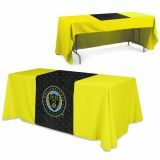 Table throws are alternatively known as table covers and they are economic way to cover up plain campaigns and plain tables! 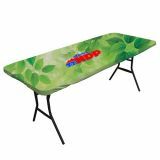 We offer table throw in variety of sizes, colors, styles and designs. 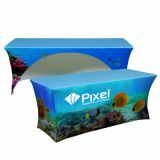 Personalized tablets will lend a distinct finishing touch to your tradeshow booth and it will easily make you stand out from other niche competitors. 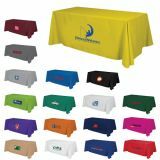 So the next time whenever you are assigned an old and worn table at the tradeshow, you need not panic because there is an entire range of customizable table throws and covers available before you at ProImprint. 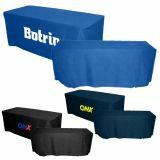 You can select from 6 feet, 8 feet as well as3-4 sided fitted tablet throws and 6-8 convertible table throws for your event. 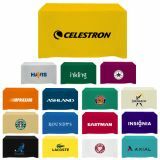 You might get confused on the right kind of customized tablet cloths and covers for your tradeshow booth. 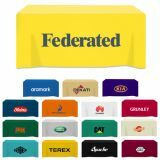 It is quite obvious when such a thoughtful selection is thrown open to you but we offer an easy solution to make it convenient for you. 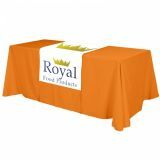 Contact our customer service team at 844-776-4677today to get over your queries and doubts regarding any of these custom printed table clothes and covers. 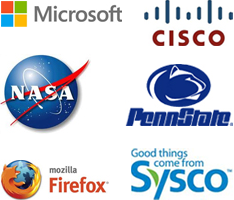 If time permits, you can write to us at info@proimprint.com.